Gather around this picnic to share - a spread of gourmet pairings both savory and sweet, this generous tasting basket will be remembered for years to come. Luxury Chocolate from Godiva, Ghirardelli, Perugina and Weinrich. Manzanilla Olives, Fruit Pome Frais and much more. What else is in this gift basket? Each gourmet item is carefully assembled, and the gift is accentuated with hand-tied ribbon. A free card is included with your personal message or greeting, as well as complimentary scissors so your recipient can easily open their gift. 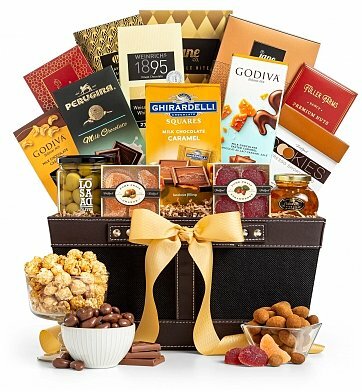 Your gift will leave a lasting impression as they continue to use and enjoy this elegant keepsake hamper. Measures 18" x 16" x 10". if ordered by 4:00 pm EDT Tuesday April 23rd. Polished Perfection is a hand delivered gift. These gifts are delivered by one of our local design centers located throughout the United States and Canada. Same day delivery is available for most gifts when ordered before the cutoff time. The cutoff time for Polished Perfection is 1 PM in the recipient's time zone. Harvey's Kettle Corn PopcornHarvey's Kettle Corn is all natural, lightly sweet and slightly salty. They use a special blend of ground caramel in with their sugar to give that added richness. Gluten Free. Harvey's Toffee PopcornOriginal Toffee Popcorn is crunchy, buttery and delicious. Air-popped and covered in real toffee coating made with butter, cane sugar, vanilla and a touch of salt. Gluten free. Red Chile PeanutsA lightly salted all natural peanuts for an irresistible snack with just the right amount of heat. Roasted Almonds with Sea SaltFresh almonds are hand picked at their peak, dry roasted to perfection and lightly sprinkled with sea salt. Luxury chocolate and gourmet pairings. Hand tied ribbon with optional personalization. Complimentary attached card bearing your personal gift message.